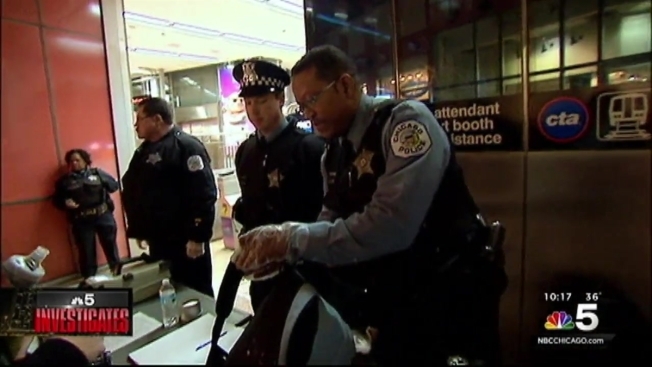 CTA Bag Screenings: Deterrent or Drama? CTA Bag Screenings: Deterrent of Drama? Your next ride on a CTA train may begin like a trip through airport security. While police in Chicago call the added security measures a deterrent to terrorism, others describe it as purely symbolic or a violation of individual rights. Police in Chicago are a year-and-a-half in to screening random riders’ bags for explosives at CTA rail stations across the city. To date, police have found no explosives and no weapons after screening 7226 bags and packages. “Despite the fact that we haven’t found any, we’ll never be able to measure what we’ve possibly deterred from coming on to the system,” said CPD Commander Nancy Lipman. Police keep the locations and times of the bag screenings unpredictable. “It’s done in other major cities and we certainly want to keep up with the times and security measures,” Lipman said. Officers pick a random number before starting each session and count people approaching the turn styles. For example, police may ask every twentieth rider to participate in the screening. Riders who agree have their bags swiped with a cloth. A police officer scans the cloth for explosives residue. The process typically takes less than a minute. But if you refuse, you can’t get in. “We have found that the passengers are very receptive,” Lipman said. According to police, twenty-three people have refused the screening since the program started in late 2014. And police said they have arrested three would-be riders who refused to be screened and tried entering the turn style. The screenings are part of five million dollars in grants to CPD from the Transportation Security Administration in its continuing effort to thwart 9/11 style terror attacks. NBC 5 Investigates has learned the federal Transit Security Grant Program funds several security projects with the CPD and CTA, including eight positions in two Anti-Terrorism-Mobile Explosives Screening Teams. According to an open records request, the total spent so far on CTA bag screenings is $1,508,824. The grants have paid for personnel costs and benefits, equipment and supplies. “The people of Chicago have the right to go about their business and travel without being accosted by the Chicago Police,” said Michael Paus of Restore the Fourth, a non-profit group which contends the screenings invade your right to privacy. Police said courts have ruled the screenings are an exception to the Fourth Amendment and do not violate individual rights. DePaul University transportation expert Dr. Joseph Schwieterman said the amount of screenings conducted so far are just a “drop in the bucket” for a large rail system with many access points. “It may well be that just the cost and the time consuming nature of this makes it impossible to scan a hundred thousand different people, but that’s the kind of level it would need for the public to perceive there’s been immeasurable change in entry points,” Schwieterman said. The Chicago Police Department said it plans to continue the screenings, and even expand them, in the future.